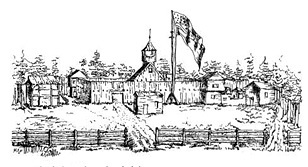 Sketch of Fort King by Lieutenant Sprague, circa 1837. Florida Photographic Collection. Whether the blacks convinced the Indians to resist emigration or the Indians, as seems more likely, convinced themselves, the Seminole allies officially registered their feelings on the subject in 1834, at a conference with U.S. Indian Agent Wiley Thompson. "General" Thompson, a personal appointee and friend of the President, called the Seminoles to Fort King, where he labored to convince them to leave Florida peacefully. Thompson's strategy for the talks leaned heavily on invocations of the Seminoles' "Great White Father," Andrew Jackson. Jackson could never believe that any of his "red children" would be "so dishonest and faithless as to refuse to go." "You solemnly bound yourselves to remove .... You know you were not forced to do it. You know ... that it was the wish of your father." Despite the paternal affection, the chiefs unanimously refused to emigrate. Initially one contingent, from western Florida, was willing to consider emigration. But everything changed on the third night of negotiations.